Video recipe - Some of the most difficult types of bread to bake are those made of laminated dough. Also called a viennese dough here in Denmark. Amusingly it is called "Danish pastry" in most of the rest of the world. 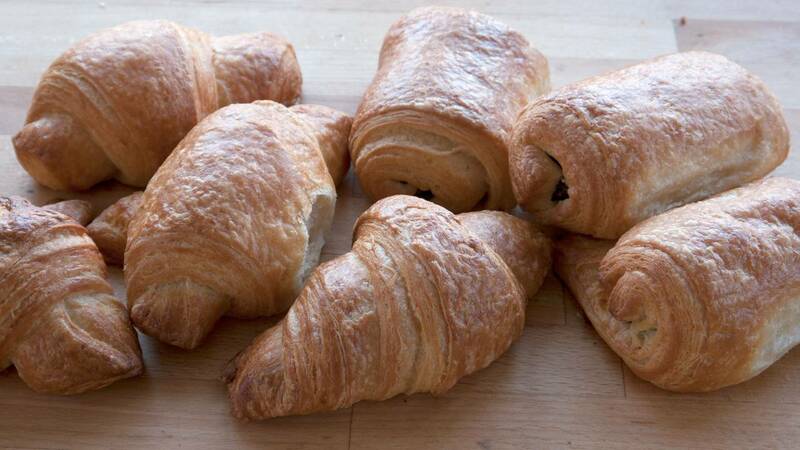 The ultimate challenge is the croissant. It is very honest and has no filling, no remonce, no glaze or other things that can hide one's flaws. There are many ways of doing it, with different amounts of "rolling-butter", number of butter layers etc. This recipe is the one I think is the best version for beginners and experienced bakers alike. Add sugar, salt and egg. 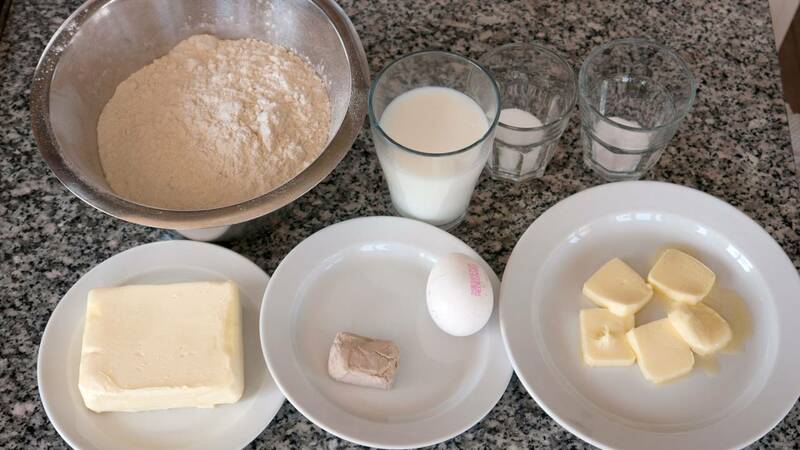 When the flour is almost kneaded into the liquid, then add the soft butter. Collect it into a ball, cover, and let it rise until doubled in size for approx. ½ -1 hour. If you have the time you should then cover it with something airtight and put it into the refrigerator for at least an hour. But overnight is even better. It will make the dough more pliable when rolling the layers. In the video on this recipe I use the danish method as it gives a better result. The english method is easier for beginners though. For an example of the english method you should watch this part of my danish pastry video on youtube. Grate the butter over the dough rectangle. Fold a letter-fold for 3 layers and a neat square. Let dough rest 15-30 minutes in the refrigerator. Roll out to a new rectangle that has a 1 x 3 size again. Roll out the rectangle that has a 1 x 3 size again. The dough has now 3x3x3 layer. That is 27 layers of butter evenly distributed. 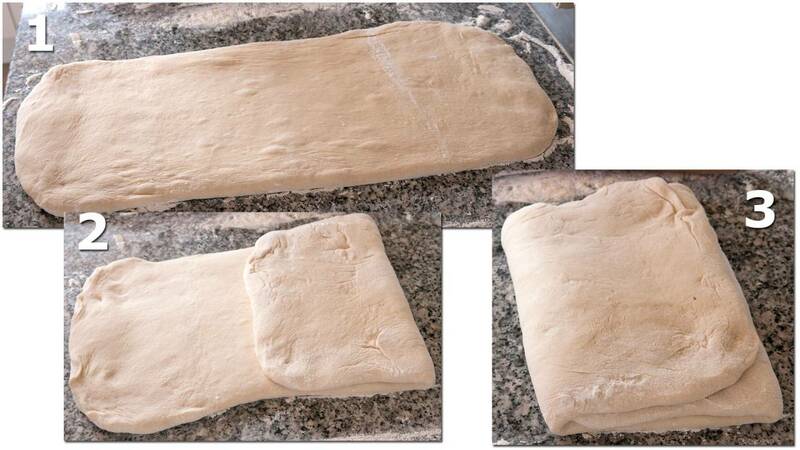 Roll out the dough to 16" x 24" (40 cm x 60 cm). Trim the edges so they're equal and straight. Cut it in the middle length-ways so you have two equal halves that are 8" x 24" (20 cm x 60 cm). Cut each half into four equal squares of 8" x 6" (20 cm x 15 cm). Cut each square into two triangles by cutting from corner to corner. Gently pull the triangles slightly long and roll them from the wide end against the tip. you should end with 3 layers. Cut each rectangle in the middle so you end up with pieces of 4" x 6" (10 cm x 15 cm). Place two strips of chocolate in the middle of the narrow part, then place two more in the middle of that and the end. With approx. 1½" (4 cm) intervals. Roll the dough together around the chocolate.. Put 8 of them at a time on a baking pan+baking sheet. They must rest on the rolled up tip. Let them rise until doubled in size from ½ to 1 ½ hours. They may not withdraw where there is so hot that the butter to melt. Then in the summer it may be necessary to take them in and out of the fridge. When they are raised then brush them with beaten egg and what fluid you are now using. Let them cool for at least 20 minutes before consuming. If you want to understand the process better, then read my article on the principles behind a laminated dough. It has tons of pictures There you can also see different variations of the method that you can experiment with to make "your own style" croissants. Hi Max, Thank you for making such a great video! I just made my first batch and I think I got a decent result (even though some things I did not do perfectly either by mistake or necessity). I have a question about butter. Do you use salted or unsalted? Also, what is the fat content of it in Denmark? I have a feeling that the butter here in the US has more water as it's certainly harder when cold than the European butters I've seen. I splurged on some nice butter since it is such an important component of a croissant, but was wondering if you have any experience regarding various types. Thanks! First time and they came out great! Fantastic recipe, thank you! But, could you clarify one thing in your text -- the baking temperature is in Celsius not Fahrenheit, which is about 400. I hadn't looked at other croissant recipes so I didn't immediately know that 200F was too low. The recipe itself has a mixture of English and metric measurements, so while I had no problems with that part (I tend to use them interchangeably as well) it didn't occur to me to question the temperature scale. 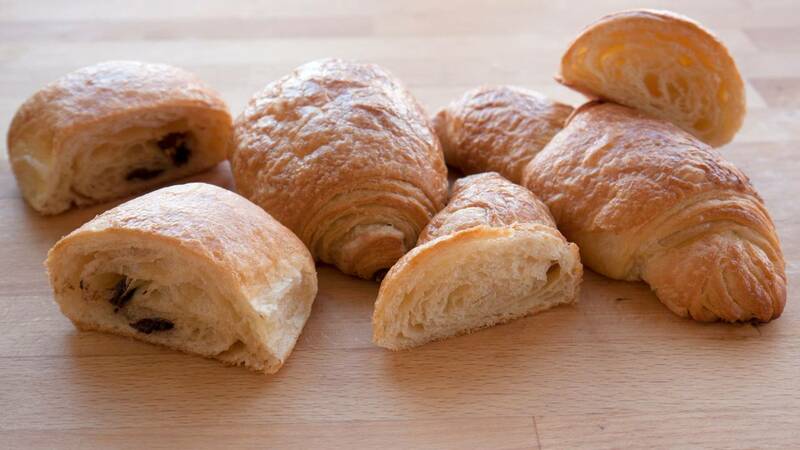 I cranked up the oven and was able save my croissants - they were flaky and delicious. Thank you, and yes that is bad. I have fixed it. Hi i was wondering if i could halve the recipe as i'm very new to baking. I'm trying to make croissants but the last batch that i tried (another recipe from another website), the croissants came out bread like. Thank you in advance for your advice.